Your website is one of the most important touch points for your brand. It's often the first point of contact, so it needs to make an impression, and work hard for your business. Last year, the Guests website wasn't doing either. To solve this problem, we needed to look at what made Guests, Guests. We took them through the T20 Communication Ready Workshop program, and it wasn't long before Guests had a clear purpose, and a strong new positioning line - 'just imagine.' From there, we created a website that did their brand justice. Before we go through the details, we wanted to share some feedback from Guests. It made our day. "We wanted to express that we are the leaders in the market place and T20 have certainly captured that, with a clean, stylish, sophisticated website. It was great to work so closely with T20, they were meticulous in creating exactly what we were after, and the positive feedback we have received from our peers has been remarkable." - Michael Robertson, CEO of Guests Group. Both of these were achieved, and then some. By taking visual elements that we developed while renewing the brand, and marrying them with clean and beautiful design, we created a website that's sophisticated, inviting, on trend and charmingly imaginative. 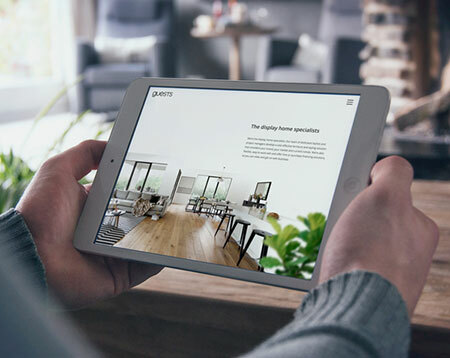 We built the site using a parallax technique, which provides a memorable, dynamic experience. This engages the audience, and brings the positioning line to life. The copy flows down the page with the words appearing in bite-sized, easily digestible portions. The tone is professional and informative, while still being approachable. And, there's a hint of whimsy, in keeping with the positioning line. The content pages - Display, Styling and About all follow a similar structure. They're designed with subtle animation and impressive imagery to showcase the Guests solutions. Importantly, each page concludes with contact fields to drive enquiries. 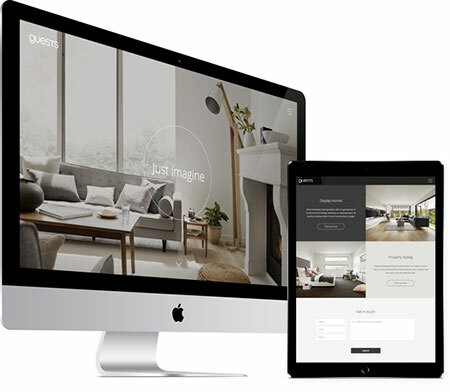 All elements combined, the Guests website now reflects the brand in a very positive way, achieving the objective of making a good impression, while also generating leads and enquiries.